So this is yet another slightly delayed holiday recipe posting. March 31 is Cesar Chavez Day in the great state of California – it replaced Columbus day (good riddance) as a state holiday. Cesar Chavez is a Latino labor rights organizer for farm workers who did a lot of good for CA and the Latino communities across the U.S. I want to note (I just learned this) that equal credit should be given to Dolores Huerta, the co-founder of the United Farm Workers and a badass in her own right. So in honor of Huerta and Chavez and Labor Rights in general, I decided to do another one of my Cali-Mex recipes this week. So this was an odd synthesis of a Zucchini salad from my Mexican vegetarian cooking class and a recipe from Everyday Greens cookbook. Measure flour, masa harina, and salt into a bowl and mix them all thoroughly. Using a pastry cutter or a fork, cut in the butter until there are no significant sized lumps. Mix the vinegar with 3 tablespoons of water and add the mixture, a little at a time, until the dough comes together. If you need more water, add it in small amounts. The dough should be soft and pliable, but cohesive and not sticky. Cover with plastic wrap and set aside while you make the filling. Heat the olive oil in a saute pan. Add the garlic, and after a couple minutes, add the onions and poblano peppers. Once they start to soften, add the corn, zucchini, cumin, salt and pepper. Saute until everything is softened, but not so long that it turns squogy. Toss with the queso and set aside. Roll out the tartlet dough and cut out little circles from it (once again my glass ice cream bowls are used to fulfill the task of a biscuit cutter). Take each circle and stick it into a spot in a cupcake tin. No worries if its a little large and needs to squish a little, that’s totally fine. Fill each one completely with the fill. Bake at 375 for like 20 minutes or so. Damn these were tasty. I had to exercise a great deal of discipline to save some of them for meals at work instead of gobbling them all as a meal and then snacks. I had these with Oberon Summer Ale (it’s back! and my all-time fav beer to pair with Mexican food) as a meal, but I think they would make an amazing appetizer at a party or something. 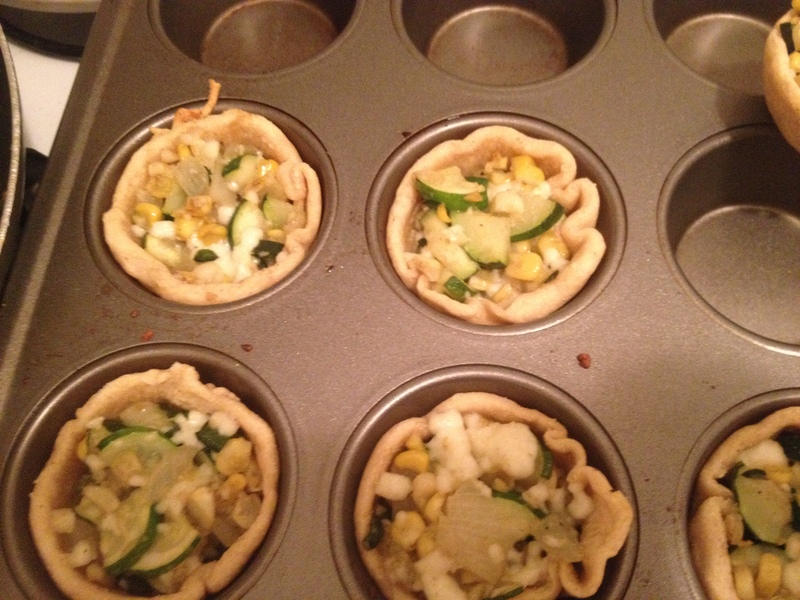 The tartlet dough is awesome – I’m loving the flour-masa harina combo, and have been using it when making tostadas for a while. Song of the Week: Mrs. Brown You’ve Got A Lovely Daughter by Herman’s Hermits. I love this song for so so many reasons, but the main two are the guitar rift in the beginning (and really the guitar throughout) and the theme of being heartbroken without bitterness or recrimination. It’s an uplifting song about lost love – which is amazing. We should all strive to be that decent regarding our former lovers. Also Herman’s Hermits are incredible and tragically underrated.